It has been a while, but I haven’t seen recently a blog post on MEDIA PACKET as part of the tools for author promotions and self marketing. It should a part of the author’s Marketing Plan in the first place. It has been called many things by others, such as “Press Kit” for example. 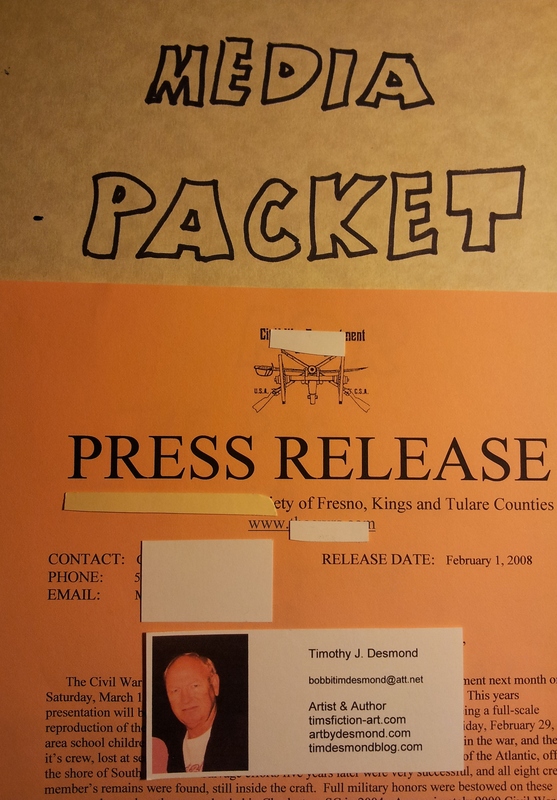 It was nine years ago that I developed a media packet on the advice from a previous publisher. I put together the certain items that were said to be important. It was great for me and I put it together and hit the road with manila envelopes to media outlets. I also mailed several. It was eye opening in the sense that there was little response to my efforts with the press and broadcast media. But, that is another issue. That was 2005 and 2006. A lot has changed since then in all media markets. Still, there are truths that remain in this endeavor, and in this business. One truth is the Media Packet. 2. A heading of one sentence or two [no more]. This should a hook similar to your query pitch. 3. A paragraph about the book. Some suggest two paragraphs, but keep this brief. 4. A paragraph about yourself. Keep this brief and interesting. 5. Purchase and contact information: Publisher information, ISBNs and websites, Author contact details. Flyer – A printable flyer with the book cover as a header and Book blurb. Interview questions – Include answers. These might lead to other questions in an interview. Cards and bookmarks – A given. Book – Freebie – Some sources advise to provide the book on request. Depending on what market and who is approached is a consideration. I regret that I did not give a book to certain individuals. I should have given a book to more persons. The next topic is the campaign. Dos and don’ts can be found on many sites offering guides and advice to and for promotions. Those are too many to discuss at the moment. More on The Campaign later.